As the sun was still astonishingly out in France Moto3 got under way and it was a brilliant multi-rider race from start to finish. It was Australian Jack Miller who would come out on top from the thrilling last lap action he pulled out an aggressive pass to deal with the attentions of Efren Vazquez, while using his braking skills to help his underpowered KTM across the line first ahead of his Honda rivals. The Red Bull KTM teenagers third win in an incredibly strong opening to the season gives him a massive 30 point lead over his nearest title rival, Romano Fenati, who retired with mechanical failure. Miller had made a near perfect start to hit the front before a mistake by Racing Team Germany rider Vazquez gave Alex Rins a large advantage and the lead. As the Estrella Galicia rider was reeled in the pack followed leaving the race win wide open. Rins held on for second, ahead of Isaac Vinales who had been in the hunt from early in the race, third giving him a career best finish and first podium. Francesco Bagnaia was next across the line as the rest of the pack arrived snatching fourth ahead of Alex Marquez who had done a lot of the work in the middle of the race to chase down Rins in the middle of the race, an eventual fifth. Vazquez crossed the line sixth. The best placing rookie was Enea Bastianini was seventh for the Go&Fun Junior Team ahead of John McPhee, unlucky not to finish higher after battling hard in eighth. Home rider Alexis Masbou dropped like a stone after a strong start for ninth with Jakub Kornfeil nudging his way into the top ten for Team Calvo. The remaining points on offer went to an improved Zulfahmi Khairuddin in 11th, top Mahindra rider Miguel Oliveira in 12th, British Husqvarna racerr Danny Kent in 13th – beating team-mate Niklas Ajo who crashed late on. Brad Binder finished in 14thfor Ambrogio while Philipp Oettl crossed the line 15th for the final point. 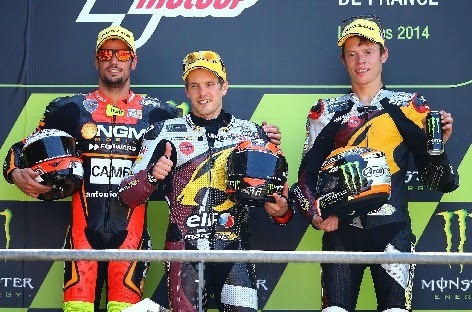 Mika Kallio played a smooth and confident waiting game before easing away to win the Moto2 race, once clear of race rival Simone Corsi he looked at ease on his way to victory in France. The result means back-to-back wins for the Finn for the first time in his career and in the process he narrows his Marc VDS team-mate Tito Rabat’s lead to just a slim seven points. Corsi had powered to the front from the second row and though eventually passed by Kallio the Italian Forward rider still equaled his career best result in Moto2. Tito Rabat staged an exciting comeback after reaching the front of the chasing group as he battled to third for a great result in France for Marc VDS, and keeps hold of his championship lead in the process. Luis Salom who was in a podium position before being tracked down was then thrown into a fight with his Pons HP 40 team-mate Maverick Vinales for position, with the reigning Moto3 champion eventually taking fourth and top rookie honours. Completing an all Kalex top six was pole man Jonas Folger, unable to capitalise on his excellent qualifying performance for the AGR Team. The first Suter to finish was piloted by Dominique Aegerter in seventh after winning the duel with his fellow countryman Tom Luthi leaving him in eighth. Sam Lowes finished an impressive ninth for Speed Up, their best rider on the day, making up places after a mistake at the start throughout the race. After a big gap Franco Morbidelli took the flag in tenth for Italtrans ahead of German pair Marcel Schrotter in 11th for Tech 3 and Sandro Cortese who took 12th for Dynavolt Intact GP. Randy Krumennacher fought to 13th, while Ant West continued his run of points finishes in 14th. Malaysian Hafizh Syahrin took the final point in 15th. Briton Gino Rea saw improvements with a 19th finishing in touching distance of the points. The only French rider to finish was wild-card Lucas Mahias one place ahead of Rea in 18th.